Synopsis- In her most emotionally charged novel to date, “New York Times” bestselling author Heather Gudenkauf explores the unspoken events that shape a community, the ties between parents and their children and how the fragile normalcy of our everyday life is so easily shattered. In the midst of a sudden spring snowstorm, an unknown man armed with a gun walks into an elementary school classroom. Outside the school, the town of Broken Branch watches and waits. Officer Meg Barrett holds the responsibility for the town’s children in her hands. Will Thwaite, reluctantly entrusted with the care of his two grandchildren by the daughter who left home years earlier, stands by helplessly and wonders if he has failed his child again. Trapped in her classroom, Evelyn Oliver watches for an opportunity to rescue the children in her care. And thirteen-year-old Augie Baker, already struggling with the aftermath of a terrible accident that has has brought her to Broken Branch, will risk her own safety to protect her little brother. Review- One Breath Away examines the very real subject of hostage situations and shootings in schools, following the wake of Columbine and various other disasters. Set in a small town in Iowa, the novel shares five character viewpoints: Holly a mother recovering from burns injuries, Augie- her 13 year old daughter trapped inside the school with her younger brother P.J, Will- Augie and P.J’s grandfather and carer, Mrs Oliver- P.J’s elderly teacher and Meg Barrett a local policewoman. A gunman walks into the school and holds a classroom full of eight year olds hostage and the school goes into lockdown. Confusion and hysteria transpires outside the school grounds with frantic parents and uninformed police officers. Short chapters pushed the story forward, creating a mood of imminent danger though this was well balanced by the background stories of each of the characters and their families. At times I felt the character stories did detract from the suspense of the classroom threat but as overlaps between the characters became evident, all the stories began to merge to inform the reader of the lead up to the current circumstances. I was also taken by surprise when the gunman was revealed, I hadn’t been expecting that and I suppose I was a little disappointed by this choice because his motive wasn’t entirely solid- I thought the other suspects would have been more convincing. 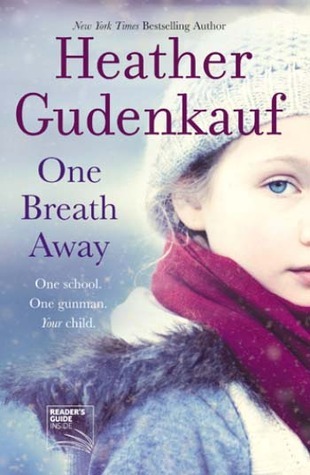 Gudenkauf has an engaging writing style and has developed characters who are well-rounded with both their strengths and weaknesses highlighted in this anxiety-provoking hostage situation where the lives of vulnerable young children are at risk. An enthralling read by an author often compared to the likes of Jodi Picoult. Review: One Breath Away by Heather Gudenkauf |”. “Book Review: One Breath Away by Heather Gudenkauf |” arlingtoncountyfair in fact enables myself contemplate a tiny bit more. I actually treasured every individual section of it.